Last evening when Shikhar Dhawan was grooming his mustache while the team was practicing for the big game against the Proteas, Dhawan got a call. To his sheer surprise his mother-in-law had called, with whom he hadn’t spoken in ages. Who would’ve thought a phone call from a saasu maa, would’ve changed the course of the game and history would be re-written. Look son, it’s an ultimatum call for you. We cannot even go out in the colony. Considering your current form and the rate at which our neighbors are teasing us, I think we will have to relocate unless you start performing. 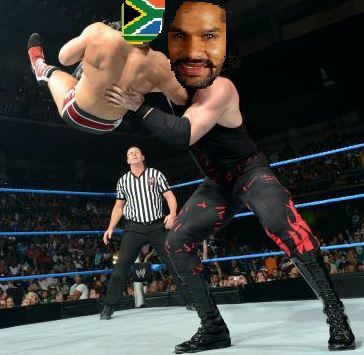 Dhawan giving Choke-slam to the Proteas! It made Shikhar re-think on his game plan and he skipped the mustache grooming session and Dhawan was seen practicing in the nets today morning. Rest is history. Courtesy his fearless choke slams, India defeated South Africa in the World Cups in the fourth head-to-head encounter finally. MoM- Shikhar Dhawan for his fearless knock of 137 off 146 balls. This entry was posted in Humour and tagged India, Melbourne Cricket Ground, Shikhar Dhawan, SouthAfrica by lalitvijay. Bookmark the permalink.